Of all the music I've played in my life, this show stands alone in its category. It had me steering our jazz quartet on a repertoire of the most iconic piano sounds I heard when I was growing up. When we got to "Linus and Lucy," I dedicated it to my brother John, who was already playing that piece on our own home piano before I knew the first thing about the instrument. 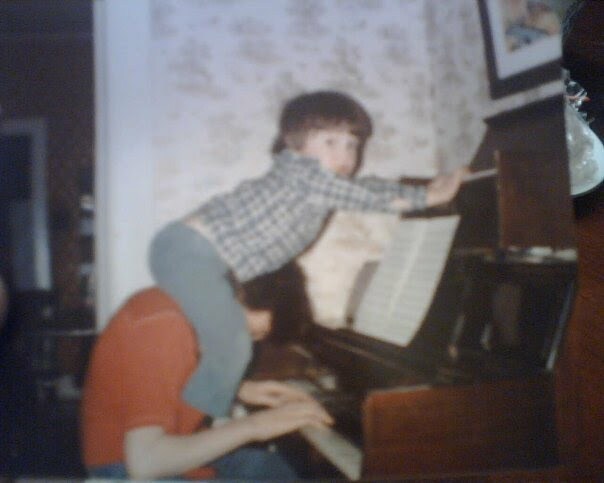 When I was little enough to sit on John's shoulders, I'd watch him play that Wurlitzer upright, and some other mini keys were on top for me to play at the same time. Needless to say, John's playing piqued my interest long before my first lesson at age 5. Some of the earliest piano influences outside of John were the pianists I'd hear on television. Faceless jazz players, mostly. Vince Guaraldi, from the Charlie Brown Christmas special that'd be on TV every year, and Johnny Costa, who I'd hear every day on Mr. Rogers' Neighborhood. The music on those shows were part of what would keep me tuned in, time after time. Ray Charles was on TV a lot in those days, but mainly it was those Diet Pepsi commercials assuring viewers that "you've got the right one, baby." If you were my age, you didn't know what he sounded like when he was doing something outside of that well-funded "Uh-huh" ad campaign. I didn't even know Ray's most famous record, "Georgia on My Mind," except I knew it as the sax instrumental that introduced every episode of "Designing Women." My mom watched it. So I went into this gig thinking about sitting on my brother's shoulders. This time, the heavy weight was on my shoulders, emulating all those faceless jazz piano players from my youth, especially Vince Guaraldi. It was a daunting task, but I felt up for the challenge. Charlie Brown shows were funny, so I wanted our show to be funny too. I decided to play it light and loose, which was the right move for the feel of that set. Paul Murr & the Snowflakes perform Vince Guaraldi's rendition of "O Tannenbaum" at Lancaster Catholic High School in Lancaster, Pa., on Tuesday, Dec. 18, 2018.